For all the people who use Nokia products here is a good product in the offing. Formally announced during the fall of March, The Nuron or the Nokia 5230 has made its way into the markets finally. 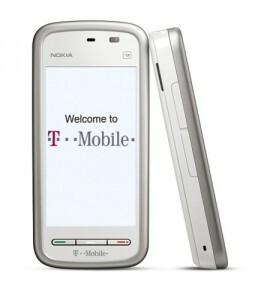 Nokia made an official announcement last month that T-Mobile would be providing carrier services for this mobile phone. The handset looks chic and stylish in its silvery white colors. A typical Nokia product, this candy-bar shaped mobile phone has a 3.2 inch widescreen, touch based display. With a color palette supporting up to 16 million colors, the display gives a maximum resolution of 640 x 360 pixels. Another prominent feature in this phone – it possesses an accelerometer sensor that senses auto-rotation or flipping – when the phone is flipped from landscape to portrait and vice versa, the sensor senses the motion and rotates the software GUI accordingly. The phone also has built in GPS and Video capture features, making it a well rounded product. It has a built in 2 mega pixel camera with an auto-zoom feature that can zoom up to 3X zooming levels. Measuring 111.5 x 52 x 15.5 mm, the phone weighs a mere 115 grams. An important feature to note is that this mobile phone will be one of the first smart phones to be bundled with a completely free map feature. Maps are pre-loaded along with the phone and can be used by users to find seek out directions, explore landmarks, restaurants etc and avail of the online guides from lonely planet. Apart from this feature courtesy of the lonely planet, Nokia’s Ovi Maps feature can also be made use of in this mobile phone. Ovi Maps is a navigation solution developed in situ by Nokia and comes built-in to this mobile phone. The phone also has an online downloads only store – the Ovi Store. This gives consumers access to a horde applications which can be downloaded directly from the portal. The phone is equipped with 70 MB of internal storage with microSD slots providing additional support and capacity. At 70$, the phone also features an FM radio feature, provides audio mp3 support and has e-mail support as well.